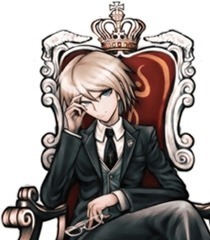 Introduce yourself as Togami, or if the song you're singing has spoken parts that works as well. My self introduction is over. How long are you planning to stand here? Youre an eyesore. Go away. Furthermore, the Togami family is not destroyed. I am still here. And I am keeping my word--I did promise to kill the mastermind, didn't I? The Togami Conglomerate could buy your entire family if I wanted it to. What is the meaning of this, Naegi?! Hmph. What an eyesore. What the hell are you looking at?